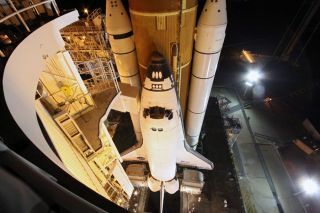 The countdown has begun anew for NASA's last launch of the space shuttle Endeavour on Monday (May 16). Endeavour and its six-astronaut crew will try again to lift off after a power glitch forced NASA to call off an earlier launch attempt April 29. The space shuttle is scheduled to blast off at 8:56 a.m. EDT (1256 GMT) from Kennedy Space Center in Cape Canaveral, Fla. In the ensuing two weeks engineers checked out the issue and replaced a broken switchbox and wiring that had caused a problem with heaters used to protect the shuttle's hydraulic power system. NASA began the countdown toward launch today at 7 a.m. EDT (1100 GMT) at T minus 43 hours. The countdown includes a number of scheduled holds before liftoff. Weather forecasts predict a 70 percent chance of good conditions for launch on Monday. While some storms are expected around the spaceport over the weekend, they are likely to move away by Monday. "The weather should all be off to the east and southeast, so we expect the conditions to improve," shuttle weather officer Kathy Winters said. "Right now we are forecasting a 30 percent chance of KSC weather prohibiting launch." On its 25th and final flight, Endeavour will launch an ambitious particle physics experiment to the International Space Station to study dark matter and antimatter. The shuttle is also loaded full of spare supplies to stock up the orbiting laboratory. The crew plans four spacewalks during their busy 16-day mission. Endeavour's crew, led by commander Mark Kelly, arrived in Florida on Thursday morning to prepare for launch. Their families, including Kelly's wife, Congresswoman Gabrielle Giffords, D-Ariz., are expected to arrive this weekend. Giffords is still recovering from a bullet wound to the head after being shot while meeting with constituents in January. NASA is expecting large crowds to come to Florida's space coast to see the launch, though not quite as many as showed up for the last launch attempt two weeks ago. "We are expecting probably slightly less than before, just due to the timing," Spaulding said, explaining that an early Monday launch wasn't quite as popular as a Friday afternoon one. "It probably may be down closer to about 500,000 this time. "After Endeavour's voyage, NASA will launch one more space shuttle, the July flight of Atlantis, before all the shuttles are retired and sent to museums.